"The first question on the Keltner List* is 'Was [so-and-so] ever regarded as the best player in baseball?' 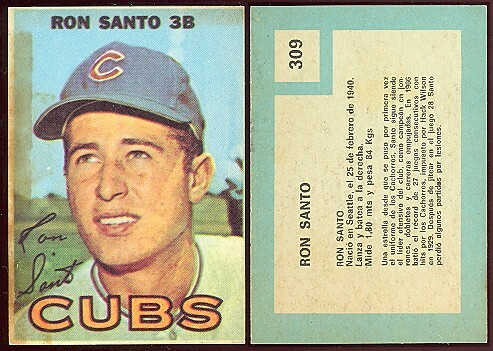 I don’t know whether Ron Santo was ever regarded as the best player in baseball, but he probably was the best player in baseball for a couple years during the late 1960s. All that Santo did between 1964 and 1968 was win five consecutive Gold Gloves while posting an OPS of 150+. A 150 OPS+ is very good—that’s about the number that Alex Rodriguez has averaged over his past five or six seasons—and Santo was saving an additional 15 or 20 runs a season in the field. He did not have that one signature season, though; he never hit better than .313 nor did he ever hit more than 33 home runs, but he was third in baseball in VORP** in 1964, sixth in 1965, third again in 1966, and fifth in 1967. "The Cubs, it should be pointed out, were not the megabrand during the 1960s that they are today. Between ’64 and ’68, they averaged less than 10,000 fans per game (9,964 to be exact). The White Sox, on the other hand, were a frisky club that consistently drew in the top three in their league in attendance. Playing on the North Side of Chicago in the 1960s was not much better than playing in Omaha. Santo’s one potential moment in the sun came in 1969, but he did not help himself by hitting .245 over the season’s final two months, contributing to the Cubs’ famous collapse." Silver also said Santo was side by side with Willie Mays as the best player in the game in 1965, and was in a three-way tie with Hank Aaron and Bob Gibson in 1968. Yet that's not so surprising. In The Baseball Encyclopedia, Peter Palmer and Gary Gillette found Santo led the National League in batting and fielding wins (their version of James's win-shares formula determining how many actual wins a player is responsible for) in 1964, '66, and '67. Now it's just a matter of getting the Veterans Committee to recognize what they've been slow to acknowledge. By the way, Silver has a new column on greatest team chokes in baseball history that's available to non-Premium subscribers. If the Cubs somehow failed to make the playoffs, they'd only place 12th. The '69 team blew a 98 percent chance of making the playoffs, to place fifth all-time. But, really, that topic is for next week -- if then. *The Keltner List is a series of questions James developed to weigh the Hall credentials of Ken Keltner -- and, by extension, anyone else. Being the best player in baseball, for any length of time, makes a good start for belonging in the Hall.